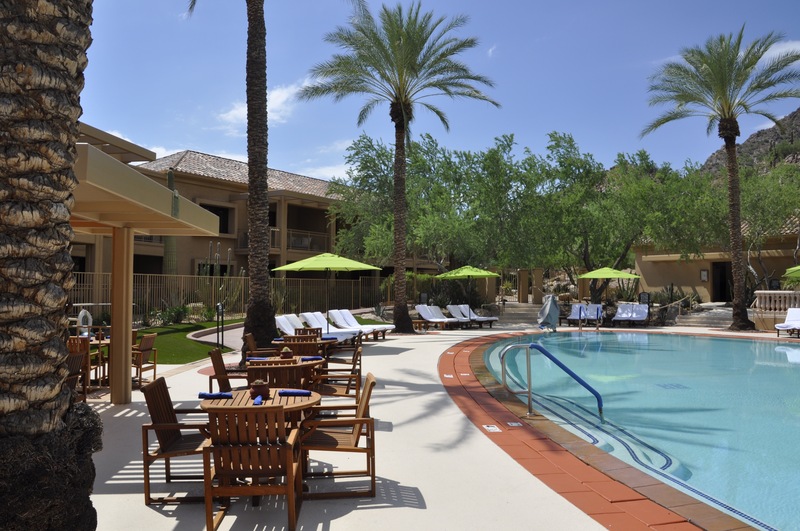 Scottsdale, AZ: It’s not often that we review individual hotels these days; the ever-increasing number of social media platforms and both hoteliers’ and guests’ use of them mean that there’s not much that’s not been written and shown about practically every lodging on the planet. Today though, we found ourselves back at one of our favourite properties, which we wrote about last in 2008. 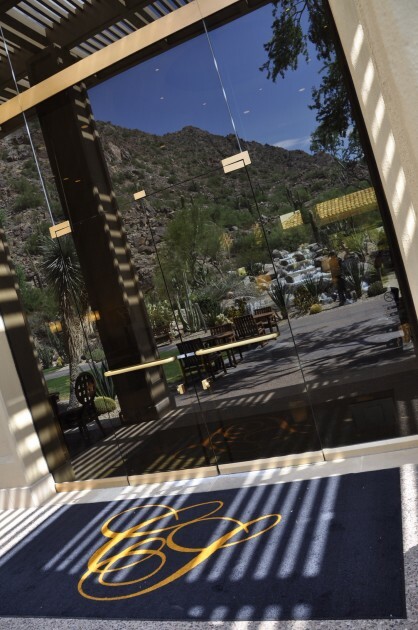 And today just happened to be the day that Scottsdale’s The Canyon Suites at The Phoenician, the ultra-luxe enclave within The Phoenician AAA Five Diamond resort, reopened to guests following a multi-million dollar makeover. Part of Starwood’s Luxury Collection, The Canyon Suites is already a Forbes Five Star retreat held in high regard by loyal returning guests, and (often) slack-jawed awe by first-time check-ins. Professional, gracious, engaging Ambassadors are permanently on-hand to assist, advise and make sure that guests make the most of their stay. At the exclusive poolside, reserved for Canyon guests alone, service is so slickly impressive, you may wonder why all resorts can’t clone the Suites’ superstar server. And at the front door, bell staff enthusiasm is way more than the Valley of the Sun’s soaring summertime temperatures should permit. So, when news of a 2016 closure and relaunch was relayed to long-time guests, the common call was for as little change as possible. Now then, is the moment of truth…. The signs of lavish expenditure are all around, as soon as the shade of the porte cochère is given up for the cool of the marbled lobby. The fountain anchors the front of house, but behind the lobby opens out in a way that’s plusher, lighter and yet more cosily intimate than before, and certainly more-so than any triple-height space could be expected to be. To the guest corridors, and the carpeting, the wall coverings, the ceiling treatments and the light fittings are all showroom-fresh. And, once ensconced in a Canyon Suite itself, only the coving, the skirting and the signature louvre-panel internal doors will prove familiar. 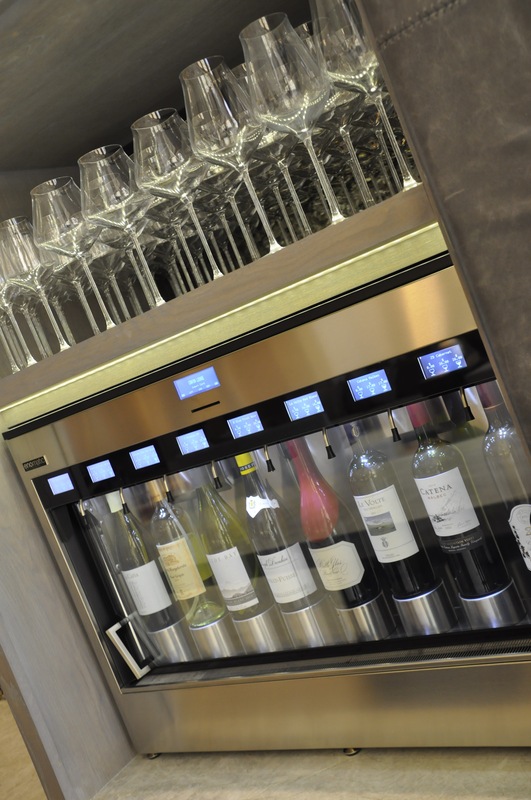 From sound bar TV systems with online access to Netflix et al, to Nespresso coffee machines, to the furniture, beds, drapery, carpeting, wall decoration and artwork – every bit is new. Here are definite mid-century cues throughout; solid, comfortable, design-led pieces that arguably echo a time when modernity was enthused over, but traditional standards of craftsmanship prevailed. A time before blue-box retail, Allen Keys and the expectation of imminent collapse defined contemporary design. Yet, despite the transformation, nothing here will frighten The Canyon Suites‘ most loyal evangelists. It’s a credit to the teams behind the renovation that they’ve so-successfully retained The Canyon‘s unique air, while zephyring the fresh breeze of change throughout the entire building. Outside, it’s familiar and new, too. 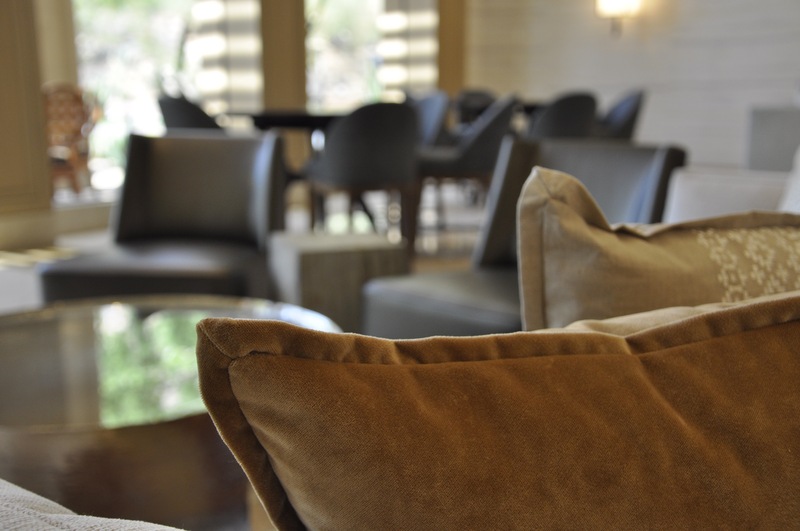 Guests will now find an al fresco dining area between the lobby and the waterfalls, ready to welcome them for the launch of The Canyon Suites‘ complimentary breakfast service. Poolside, there’s barely a shade of change, with eagle-eyed Canyonistas perhaps the only ones who’ll spot a new hue. Sports fans, in particular, availing of the pool’s private cabanas will doubtless appreciate new 32″ LCDs on which to catch the game, whilst continuing to chill out of the sun. 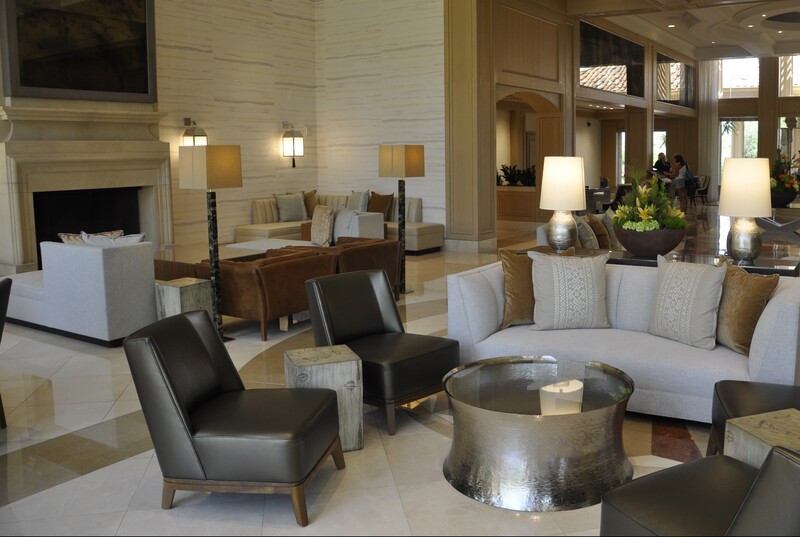 But, for many guests the biggest change, and the one that reportedly a significant number have long campaigned-for (we even mentioned it in 2008), is the final arrival of The Canyon Suites‘ own bar, to compliment the lobby’s new lounge. It’s a haven of craft whiskies, of wines cellared with the latest technology; it’s an open wall where intimate evenings will be accented with small bites, and where sun-flooded mornings will see The Canyon‘s market-fresh breakfasts greeting early-risers. With The Phoenician’s main hotel building also receiving the first hints of a 2017 full-scale reworking, aimed at establishing the whole estate as the finest resort in whole South West, it’s heartening to see the care and attention that’s gone in to The Canyon Suites, and into reflecting the thoughts, feedback and requests of countless guests. Indeed, it’s not just the relaunching of The Canyon Suites; it’s definitively the reloving of The Canyon Suites. 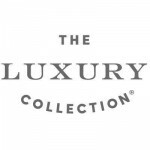 For more information, visit canyonsuites.com, or luxurycollection.com. 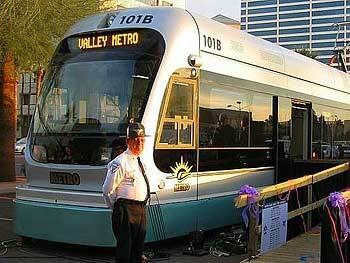 If any city is going to struggle with the stratospheric rise in the price of oil, it’s going to be Phoenix. The Arizonan capital is the epitomy of the American Dream of limitless expansion driven by the all-conquering internal combustion engine. Against this background, it’s encouraging to see that the city is investing in a light-rail tram system, but as a solution to a looming crisis, it’s a sticking plaster on an impending amputation. Still, while the sun shines (and boy, does it shine) things have been good. The Greater Phoenix area is comprised of several distinct cities, among them the City of Phoenix itself, Tempe, Chandler and our home for the next 8 days, Scottsdale. Each of these cities has a particular character, indeed brand, and there is a pride and competition between them which makes for pleasant civic characters. The City is ringed by a main gyratory freeway, and bisected by several other penetrator routes. Navigation is easy, however the first turn from the airport may be the hardest. That’s all down to the relevant newness of the Rental Car Centre, whose location doesn’t seem to have been picked up by lots of route information providers. The trick if heading to Scottsdale, therefore, is to retrace the route of the shuttle bus all the way back to the airport terminal and then out the other side. Look for the 44th Street Exit and head North to Camelback Road where you hang a right alongside the southern flank of Camelback Mountain. Given the short inbound flight from Las Vegas and therefore the minimal risk of missing anything alcoholic and of quality, a hire car is definitely the way to go. A full-size from Hertz, through Amex and with #1 Club Gold Service was under £30 inclusive for a one-way 24hr hire. It’s a 25 minute drive in weekend afternoon traffic to our hotel, The Phoenician. Holder of the AAA Five Diamond Award and repeatedly named in the Conde Nast Gold List, The Phoenician is part of Starwood’s Luxury Collection of individually branded properties. It’s considered a flagship hotel and is not only managed by Starwood, but also owned by them and Starwood’s South West Regional Office is on-property. The hotel has a particular style, which is probably best described as late 20th Century American Luxe. The main hotel building spreads in two crescent wings either side of the lobby, with a further wing backing off the hotel at the base of Camelback Mountain. The crescent wings frame terraces which play host to bars and pools (the lower of which is mother-of-pearl lined) and which are bound at their base by an ornamental necklace lake filled with koi carp (and a turtle). An oval lawn spreads out beyond the lake and is ringed on the facing side by two-storey casitas with drive-up access, the central Centre for Well Being (spa), Fitness Centre, Funician Kids’ Club and Beauty Salon. Between the casitas and to the left looking from the main hotel is access to the Golf Club and its cafe, and the Windows on The Green Restaurant above. It is a popular convention hotel (a new meeting wing is slated for 2010) and also has facilities for weddings. 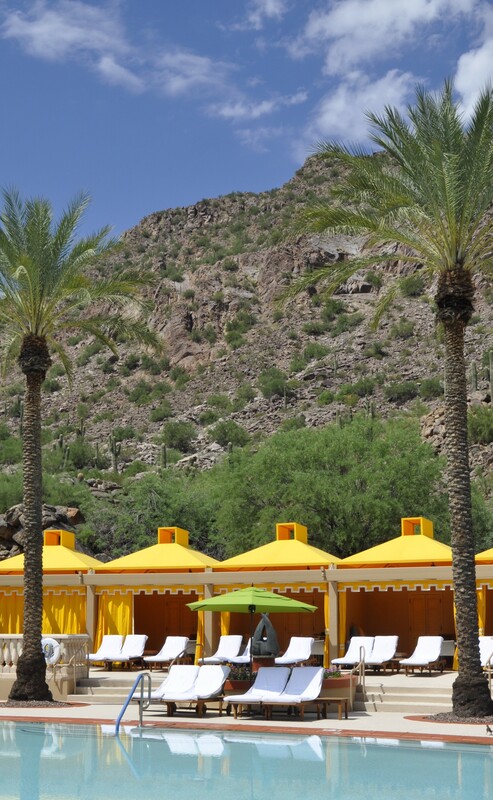 Although there are some family-friendly facilities, such as the aforementioned Kids’ Club and waterslide, Starwood market other hotels such as the Westin Kierland and Sheraton Wild Horse Pass as more suited to younger families. The Phoenician has a strong local following who dine there and seems also to be a favourite of college student parents visiting their young ones at Arizona State. Repeat custom appears high, evidenced by numerous overheard and participated-in conversations. This is my second stay at The Phoenician, but the Meerkats first and I’m interested to see what they think. Last time (2007) I had actually booked and rebooked several times as different SPG promotions were launched. These are real dealmakers for me, as combinations of double/triple-points and one-off bonuses can easily bank the equivalent of 25,000 BA Miles from a 12 day stay. I settled then on a $299 tax incl B&B; rate, which offered the fourth night free. Unlike some Starwood rates (eg ‘Free Nights at Resorts Worldwide/35% Off Best Available Rates), this benefit is repetitive and therefore every fourth night is comp’d. Cruising up the hotel drive in last year’s Mustang, we presented ourselves at the gatehouse and were asked to drive not to the main hotel lobby, but instead to the Canyon Suites which occupy a separate building. A cursory glance at the web reviews for The Phoenician will elicit the knowledge that the Canyon Suites are considered the place of myth and legend – a fantastical place to which no Starwood Preferred Guest status-holder has ever been upgraded. Well, there I was, Starwood Preferred Guest Gold (not Platinum) on a promotional rate and I was being met on the steps by one of the seven Canyon Suites Ambassadors who fulfil the combined roles of concierge, butler and receptionist. The suite was superb and, frankly, I was spoilt to the extent that I wasn’t going to take a chance with The Meerkats this year. So, the 2008 trip beckons and I register for the SPG third quarter promotion. I want a double double room and, conveniently, this opens up a neat access route to the Canyon Suites. Each suite, you see, is separated from the next by a connecting double double bedroom. These bedrooms are furnished to exactly the same standard as the suites – they just lack the additional space and one or two features like a fax/printer and spa bath. 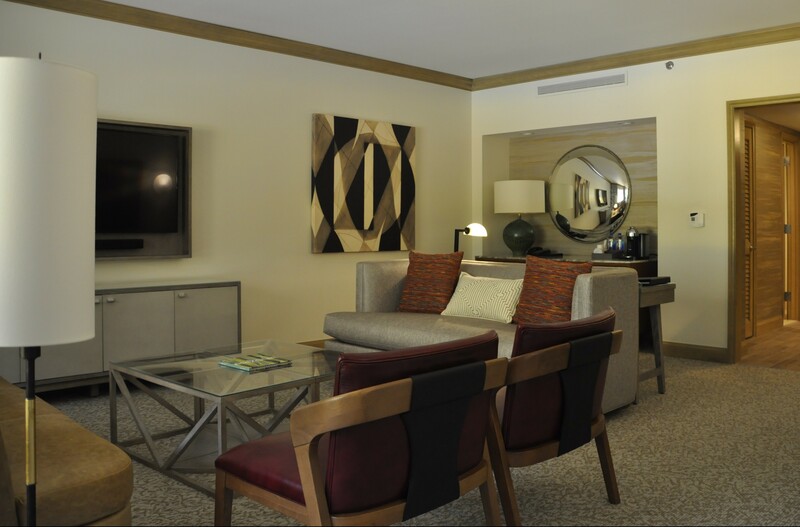 All other Canyon Suites amenities remain available and the rooms themselves are far from small. They are also bookable separately, but seem sometimes not to appear on a general rate search. The modus operandi therefore is to seek out the 4 for 3 rate – Taste of Luxury – and then do an availability search based on that. Hey presto, $429 inclusive for 3 people. Once again then, we present ourselves at the gatehouse and are directed to the Canyon Suites drive. On this occasion, we are met by the bellhop at the car and an Ambassador intercepts us as we walk into the lobby. As on the first visit, there are no check-in formalities since all details are held from SPG and the credit card used to guarantee the booking. We are walked to our room and shown around, the detailed tour we enjoyed (and needed) last time being declined on this second visit. We’re offered coffee which arrives moments later and gives us the opportunity to take the weight off before we finally allow ourselves to properly unpack for the first time, despite being 10 days into the trip. 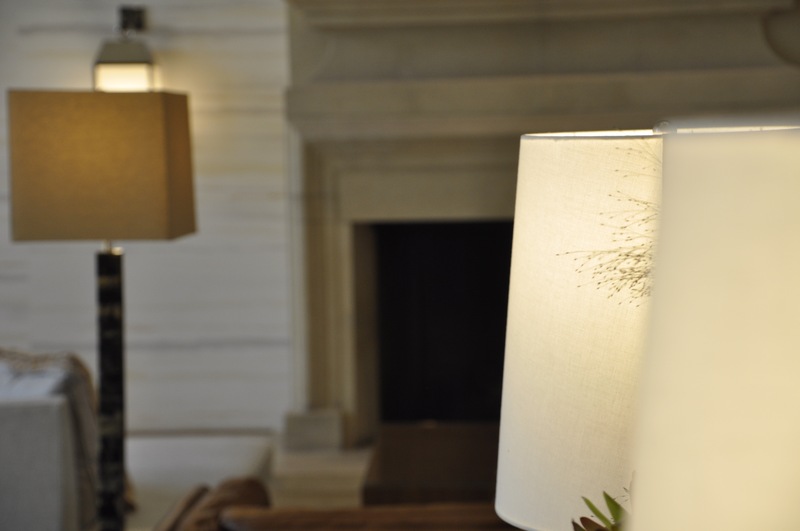 The decor throughout the Canyon Suites is certainly more contemporary than the style of the main hotel, with muted beiges and greys set off by features of turquoise and pewter. 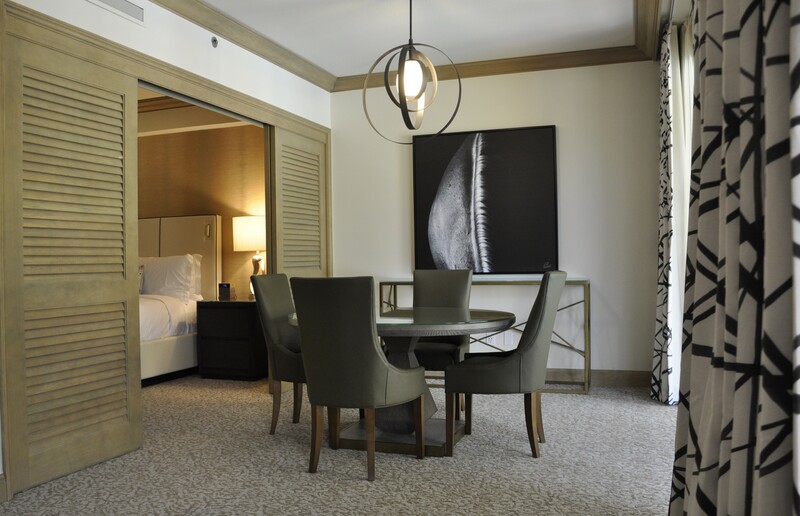 Suites comprise a bedroom separated on one side from a dining area by sliding louvred doors, and on another by a traditional door to the desk/office area. Between the office and the dining area is the living area with sofa, chairs, coffee table and large plasma. 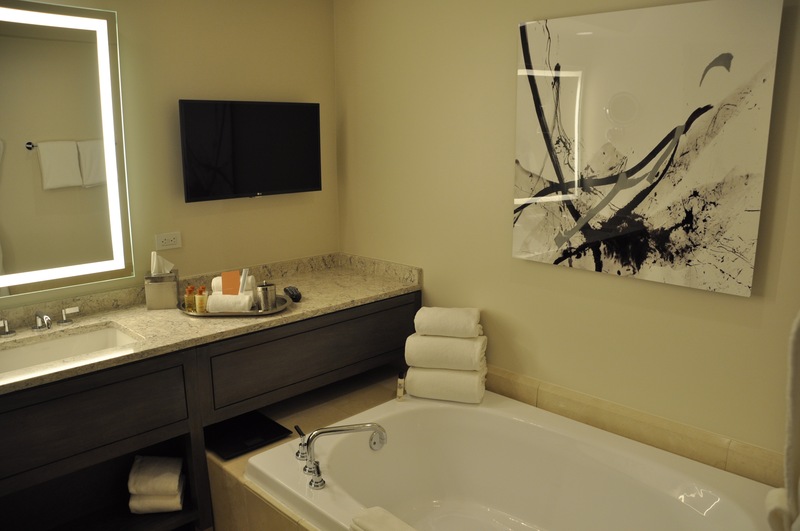 The bedroom too has a plasma screen and the bathroom leading off has a smaller LCD screen above the over-sized spa bath. The loo is in a separate room off the bathroom and there is a spacious shower cubicle. Toiletries are a grapefruit and eucalyptus combination, branded for The Phoenician and made by Gilchrist & Soames. They are generous in proportion and make for useful gifts for maiden aunts upon return to Blighty. At the entry to the suite there is also a guest loo and abundant storage along the passageway that leads to the connecting door to the adjacent double double. All suites and rooms have furnished balconies with a minimum of a day bed, two chairs and a table. 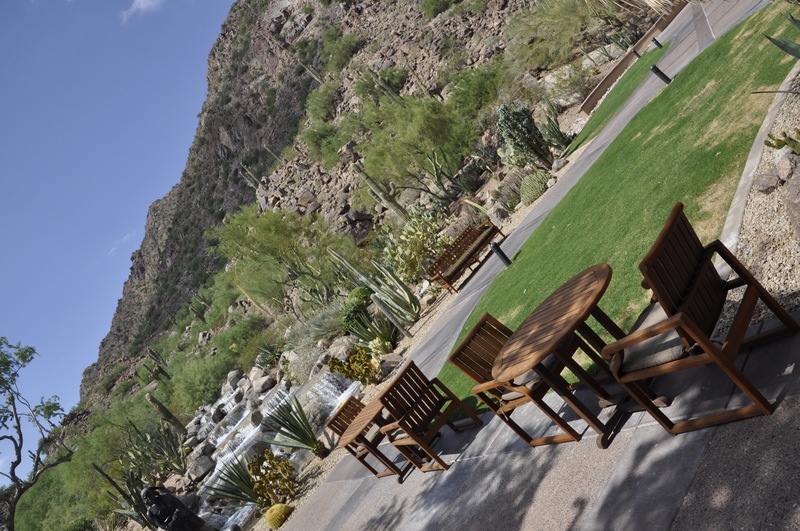 Views are either of the pool and Camelback Mountain, or the quieter outlook of the Golf Course. The Canyon Suites has its own separate pool, with abundant beds and also cabanas for hire (can’t see the point myself, but there you go). Each bed is provided with a couple of towels and pitchers of ice water are delivered and constantly replenished. There is free wired broadband in the rooms and free WiFi around the pool (can’t see the point…..). Signs direct you to the Canyon Grill, but this is actually something of a misnomer. All service is poolside or at your lounger/cabana, with four tables at the far end of the pool if you wish to dine at a table. The menu is reasonably extensive – American and Southwestern snacks and salads – and mirrors that offered by the pool bar in the main resort area. Morning tea or coffee is served by your Ambassadors on a silver tray and there is a coffee and pastry station in the lobby, replaced later in the day with Iced Tea and cookies. Come teatime, one of the hotel Sommeliers picks a couple of bottles from the million dollar cellar and treats you to a wine-tasting in the lobby with assorted canapés. It’s a great way to learn about wine in a completely sales-free environment. In fact, I’m absolutely amazed that they don’t take the opportunity to flog you some. A couple of Mercedes R-Class are available to run guests into Scottsdale on a complimentary basis, which is useful for shopping at Fashion Square and dining around about. Should an R-Class not be available, then the in-house Execucar rank will provide a Town Car which the Canyon Suites will cover the cost of. It’s about a 150 yard walk from the Canyon Suites to the main hotel lobby but, if heat or fatigue prove too great a barrier then a golf buggy will be summoned to buzz you down there. Likewise, if you need a lift to the spa or the golf club, then a buggy (or Mercedes) will appear. 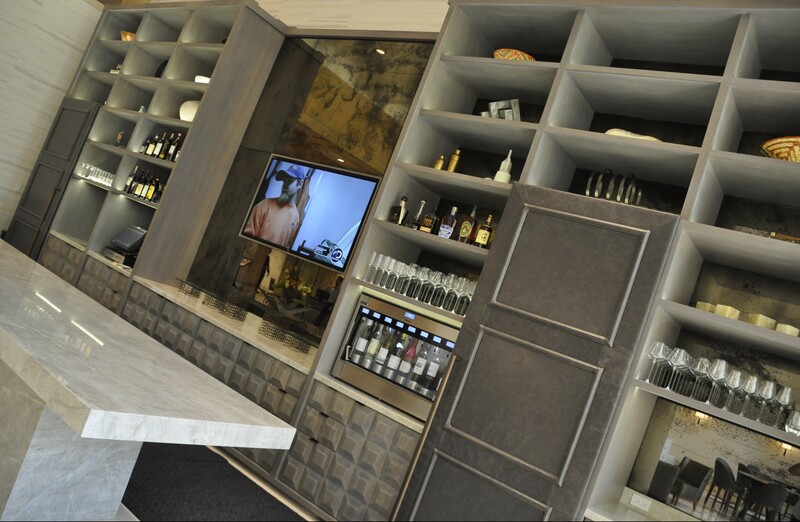 The one facility that is arguably missing is some kind of evening bar service in the Suites lobby however – for those times when you really can’t face the busier hotel bar. Breakfast can be taken in your room/suite, or in the hotel’s Il Terrazza Restaurant. In the restaurant, there is a choice of buffet or a la carte, with a chef manning the central station to cook egg dishes to order. Seating is indoor or out on the terrace, but the warmth even at the outset of the day – and the usual outdoor problem of the odd scavenging bird mean that air conditioned comfort is the only choice. Orange juice and coffee are the default offerings, but your server will provide other juices from a wide selection at back-of-house and also tea. Remember, this is America, so tea will not come with milk unless asked for and, unbelievably for a property of this calibre, they did run out of English Breakfast one morning. It did appear that the spread was slightly less deep than the last visit also, but this may very well have reflected the fact that the whole property was much less full than last time. The restaurant has just emerged from a refit which, it has to be said, is not 100% successful. Although the previous design was beginning to show its age, the new version is somewhat less spacious and suffers, in particular, from the use of some very expensive but very ‘clingy’ velour. Ladies, hold on to your skirts! It’s a long way from being in any way unpleasant – just not quite perfect. Over the years when I was travelling for work, I became more and more anaesthetised to the ‘joys’ of restaurants and nightlife and, despite my still tender years, I’ve really come to appreciate not going out all the time. Indeed, for a few years, I delighted in self-catering villa holidays and cooked myself most of the time. It’s only more recently that I’ve returned to hotels, but I apologise now that the information I can offer on bars and restaurants in the hotel and Scottsdale is limited by my continuing preference for ‘staying in’. I also find that my appetite is somewhat suppressed in the Sonoran Desert heat. The ability to avoid going out to eat every single night is enhanced by the flexibility afforded by having a rental car for at least the 24 hours immediately following arrival at Sky Harbor. Just off East Indian School Road at Miller, for example, you’ll find a perfectly serviceable Fry’s supermarket, at which you can stock up on provisions to bring back to the hotel. The trick here is to go to the Customer Service desk first and pick up a VIP Club Loyalty Card. You’ll have to fill in the form attached (but a UK address will ensure that you never make it onto the database) and you’re good to go. You’ll then see that, for many products, there are two prices shown – one for cardholders and one for non-cardholders. The savings can be significant; look out especially for great cardholder deals on wine. You’ll have plenty of space in the cupboards back at the Canyon Suites, the fridge is a full-size one that you can push the hotel’s contents to the back of and, if you don’t want to walk through the lobby with your booty, then just forego the free valet parking and drive yourself into the underground spaces and come straight up in the lift bypassing Reception. 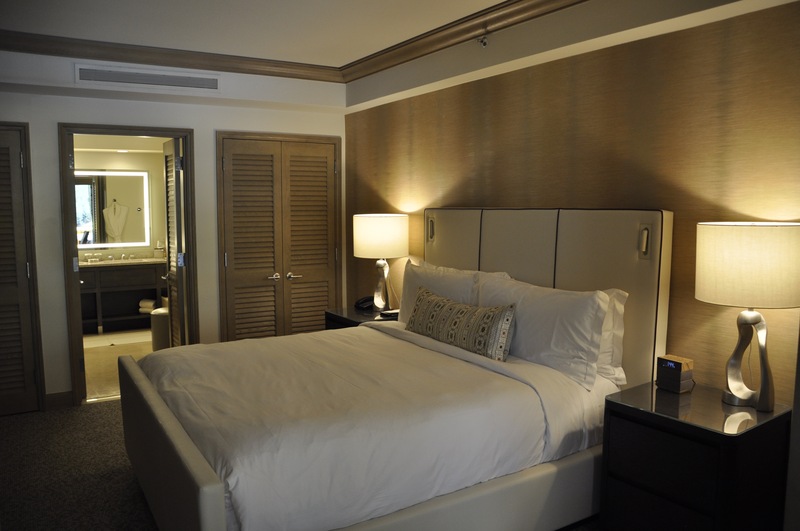 Turndown service includes any ice you may need and, of course, you can request more at any time. If you do intend heading out, beyond the hotel’s own eateries, then the choice is wide. 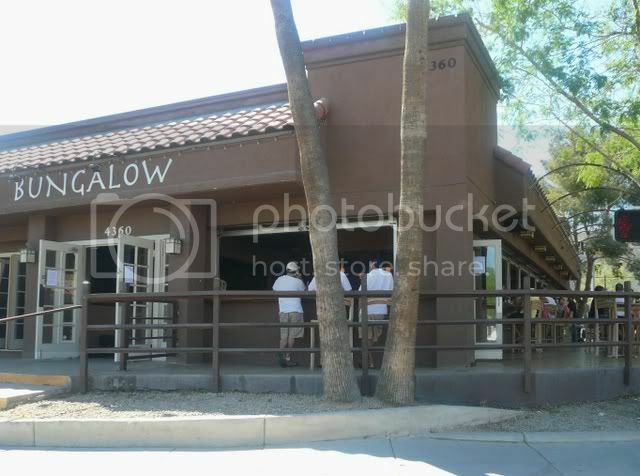 There are plenty of bars and restaurants clustered around the Old Scottsdale, Waterfront and Fashion Square areas. The best of them all, without a doubt, is Mastro’s at City Hall, which is a first class steakhouse with live jazz most evenings. You can eat in the booths of the front bar area or the more traditional tables which take up the rear and largest portion of the building. Your Ambassador will organise a table but do bear in mind that it is busy every night of the week. If you have a particular date in mind, then make use of the pre-arrival email offer which you will receive from your Ambassador, to ensure that you get your preferred time. The free limo to Fashion Square will drop you at Mastro’s, which is next door. The service style is very New York – busy, professional with dedicated teams of servers who each have their own specific roles. The menu is extensive and identical in both bar and restaurant, but the principal word of warning is that the portions are huge, even by US standards. MCC, the aforementioned veggie, was happy to cross the threshold of this temple of bovine cuisine, but of course the menu was hardly skewed to cater for those with a strict ‘no bones’ philosophy. There is fish, but that’s mostly a no-go in this case too. The starter and sides offer does provide a number of choices however, and this is where things can start going obesely wrong. An appetiser portion of toasted cheese ravioli proves to be the size of a large main course anywhere else. The chopped salad side is yet bigger. The single portion of fries comes in a tureen and the ‘off-menu’ (but seemingly always available) lobster mash is likewise of gargantuan proportion. The beef, filet mignon and signature bone-in filet is, frankly to die for. When we can make no further impression in that which is placed before us, we signal to our server that the war is over and that we can take no more. Naturally, she offers the dessert card. Declining politely for fear of imminent admittance to the nearest Bariatric Ward, we accept coffee and begin the slow process of digestion. At which point, one of the army of servers arrives with plates and cutlery, swiftly followed by another one who lays in front of us a ‘Warm Vanilla Cake’ with ice cream. As we move to (half-heartedly) suggest that there has been some mistake, our principal server glides by to advise us that this is a complimentary gift from The Canyon Suites Ambassadors. Amazingly, we find room. The bill tops out at USD250 for three including a tip, plus wine and it’s a USD15 out-of-hours ride back to the hotel with one of the limo companies who hold cars outside the restaurant. If your desire is more to watch motorised America go by and are looking for something casual, then the outdoor terrace of The Bungalow is a decent enough place. 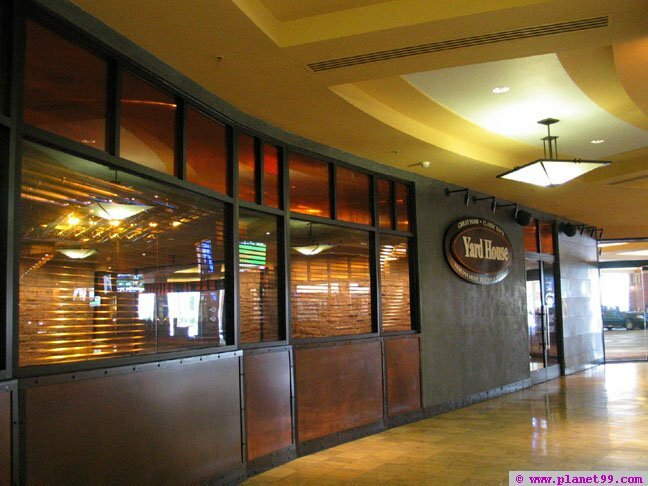 For an all-American sports bar with good food at very good prices then head for The Yard House in Fashion Square. It’s next to Crate and Barrel and the Valet Parking Plaza. There are useful happy hour promos and there is some ‘outdoor’ space – but it is not open air. Likewise, the Kona Grill (Pacific Rim) and Z’Tejas Grill (Mexican/Southwestern) opposite the Yard House are also worth a try. For a respite from the heat, the free limo is primarily offered as a way of getting to and from Fashion Square, which is currently being extended to include a new branch of Barney’s New York. There is already a wide selection of ‘classic’ US stores including A&F;, Kenneth Cole, Express Studio etc., complimented by some more high end offerings like TUMI, GUCCI and Yves Sant Luigi. (I made the last one up – but you know what I mean). The Biltmore Mall is a short drive away too, but not on the free limo run and, therefore, as yet unvisited. If your tastes are more outlet than couture, then there are two options in the Greater Phoenix area – but both will realistically require a car. The bigger by far is Arizona Mills (below), which is an easy (outside of peak hour) drive around the loop freeway to a site on the Southern side of Sky Harbor in Tempe. There is a decent selection of the outlet stalwarts and, if that’s what you’re looking for, you’ll do fine there. The other, smaller, outlet is Outlets at Anthem which is North of the metro area and, at least in my experience, not so easy to find. The selection of retailers is complimentary to Arizona Mills – you’ll find a Bose and Ralph Lauren store here but not at AM, for example – but the centre is built in ‘Hacienda Style’ so it is open air and therefore not such a good choice for a midday haven from the nuclear-powered grill in the sky. There are a number of longer day and overnight trips to take for the Phoenix tourist but, in my opinion, the best (and not too lengthy) of them all is the Apache Trail – the road built to allow the construction of the Roosevelt Dam on the Salt River. Taking the 101 loop south from Scottsdale to I-60, the early part of the route hurls you along the Western edge of the metropolis, with the Superstition Mountains visible in the Eastern distance. Turning to face the mountains on Route 60, the freeway progressively constricts from an eight-lane runway to a more manageable two-lane dual carriageway with seemingly perfect relation to declining traffic levels. Beyond Apache Junction, the route leaves the freeway and heads North for a short distance into the town before resuming an Eastward trajectory into the hills. This link between freeway and AJ offers a full-service petrol station and store, which is a good place to top the tank and take on supplies, as opportunities for the remainder of the route are limited. Leaving Apache Junction, the first point of interest is the ‘abandoned mining town’ of Goldfield. I use inverted commas because, like a lot of these attractions in the US, little if anything is authentic, other than the location (which is only approximate, not actual). It’s a fun (free) way to spend half an hour or so, with plentiful if somewhat tacky photo opportunities. Actually, it’s also worth mentioning at this point that the other, similar, attraction in the area is ‘Rawhide’. Ahem. Not only is this entirely unoriginal in its construction, it is not even original in its location, having been removed some years ago to a vacant lot in the grounds of the Sheraton Wild Horse Pass. It’s noted for its steakhouse, apparently, and theatrical shoot-outs – but opening hours are limited by the heat to evenings in Summer. On our visit on a previous trip, it was clearly still a bit too hot for the horse-mounted hombres, and the shoot-out was postponed. Back to Goldfield however and the Apache Trail heads further East into the Superstitions. After a few miles, the entrance to Tonto National Park is passed (no fee) and the road begins to dip and rear up around hummocky scrub land on its way to Canyon Lake. It’s at the viewing point above the lake that you’ll see at least one of the targets (or origins) of the many watercraft that you’ll have been following and passing along this seemingly unlikeliest of roads to be carrying marine traffic. Indeed, just outside Apache Junction, the roadside boat dealer and repairer looks mighty incongruous next to the ubiquitous saguaro cacti. High above the lake, the outlook is over a glistening body of water streaked by all manner of boats, jet skis and surfers – all achieving seemingly impossible speeds and only narrowly missing each other. It’s quite a spectacle. Heading further into the wilderness, the next stop is Tortilla Flat – locally prefixed by the slogan ‘Where the **** is’ and suffixed by a ‘?’. It’s a justifiable question. Founded originally as a camp for the road and dam builders, the population numbered several thousands in its heyday. The little remaining amounts to a saloon, shop, ‘museum’ and a few other limited services. If your Tatarama preference is for glass-encased scorpion paperweights, then this is the place for you. If you are of such nervous disposition that such a souvenir gives you the shakes however, then you should probably chuck-a-u-ey at this point and head back to civilisation, for beyond Tortilla Flat, the tarmac runs out and the real fun begins. Legend has it that Phoenix residents consider the Apache Trail to be an essential day out when entertaining first-time visitors. The act is, apparently, to wait until the first steep downhill grade, whereupon the driver stamps the floor repeatedly underneath the pedals and shouts ‘**** the brakes, the ****ing brakes have gone!!!!!! !’ Cue much panic and subsequent mirth, and the hope that the driver remembers that next time s/he does want to brake, they aim for the pedal and not the floor. On most occasions, there won’t actually be time to make that mistake inadvertently…..
A couple of miles on from Tortilla Flat, once the metalling has ceased and the dust and dirt road takes over, Fish Creek is the principal attraction. The road twists, falls, hugs and swings around the side spurs of this dramatic canyon. Nothing like the size of its Grand cousin in the North of the State, the charm and impact of Fish Creek lies in its lack of people and commercialisation, the total immersion that the road provides into the landscape and the regular pricks of fear that come from not being quite sure how close you just came to plunging over the edge. There’s a good little spot to stop and look with a car park, basic loos and a concrete boardwalk to a viewpoint opening on to one of the wider vistas. The Apache Trail is popular with motor bikers, and the viewpoint seems to be especially popular for their ash-scattering ceremonies. The likelihood being, of course, that this was both the penultimate and ultimate resting place of the unlucky urn-occupant…. As the road continues to challenge the realities of friction (or lack thereof), gravity, and the oncoming selection of vehicles which are clearly unsuitable by virtue of oversize or under-ruggedness for the terrain they traverse, it’s a popular pastime to look back and upwards toward the road just travelled – and spot the pan-caked wrecks of vehicles that failed to make it as far as you have. Much fun. Apache Lake succeeds Fish Creek as the next attraction, from where boats can be hired to variously speed or chug up and down the serpentine expanse of water. The Lake access is somewhat below the Trail and the road to it is steep and narrow enough to mean that a decision to take it can’t be reversed until the car park at the bottom is ultimately reached. There’s a rudimentary cafe and general store down there, along with the boat ramps and marina. If your progress thus far has been ‘cautious’, then you may not feel you have time to drop down to the lake and, in fairness, you’re probably not going to lose sleep over passing this detour by. The better views, thanks to the elevation, are actually from the Apache Trail itself until, a few miles further on, the road comes down to meet the waterline of the upper reaches of the lake, from which vantage point you can get a good idea of what lake life, fishing from pontoon boats, is really like. The final goal of your route is the mighty Roosevelt Dam, which holds back the waters of Roosevelt Lake behind it. At the time of its original completion in 1911, it was the largest masonry dam in the World, with Lake Roosevelt being its largest artificial lake. It’s no understatement to say that no single project did more to facilitate the large-scale settlement of Central Arizona, thanks to the irrigation possibilities which it opened up. In 1989, the rebuilding of the dam was completed following a survey and research project which proved that the original structure was not in fact high or strong enough to withstand the recalculated maximum ‘100 year’ water level of Lake Roosevelt. It’s this new, larger and sleeker construction which quite suddenly looms up in front of the Apache Trailer – an almost shocking return to the built environment from the seemingly little-touched wilderness just passed-through. Again, there is a useful little car park and boardwalk to view the downstream side of the dam and then, as the road paving begins again and the dam itself is passed, there is another opportunity to get out of the car and view the reverse side, the bridge carrying Route 88 and the utterly different landscape of Lake Roosevelt and its surrounding topography. It’s almost another World from hereon in, particularly thanks to the unaccustomed smoothness of progress. Taking a right turn on to 88, the wide, gently undulating road follows the shores of Roosevelt before climbing away from the water and then running down again to a point just outside the town of Globe, named in honour of a huge, globe-shaped boulder of silver discovered there in the 1870s. The area still plays host to a major copper mining operation, which is largely the concern of the Resolution Copper Company, a new joint venture between BHP and Rio Tinto. Turning right again on to I-60 to begin the closing of the loop back to Phoenix, the edges of Globe give way to its twin town, Miami. Visitors to Broken Hill in New South Wales in the early 80s will feel much at home here, as the first shoots of a regeneration into a centre for arts and antiques push through the dereliction of a town whose boom times were, until recently, considered long past. It will be interesting to see how Miami progresses as, just as the place seemed to be rattling its death, the commodity markets have seen the price of copper and the other minerals mined locally rocket. All of a sudden, uneconomic lodes become economic, and the towns are feeling a surge of the extractive activity that the nascent tourist business was thought essential to replace. Miami’s Main Street is certainly worth the slight deviation to the west of the main highway to at least get a glimpse of the heart of America, tarnished and worn but architecturally fairly unchanged since before the Depression. Although the bulk of the aahs and oohs of the day will have come from the unpaved section between Tortilla Flat and Roosevelt Dam, the trip gives up one last treat for the eye as I-60 weaves its way through Queen Creek Canyon, a rugged gorge at the Western end of the Pinal Mountains. The traffic is much heavier by now, so take it steady and look out for one of the few lay-bys if you want to take in the views a little more safely. It’s an area popular with hikers and climbers and you may well see lycra-clad waifs spidering up the improbably vertical and even reverse-overhanging walls. Fools. The road (which is in places being upgraded to bring the reach of the dual-carriageway yet further East toward the town of Superior) grows steadily busier and then, beyond the improvement zone, the existing dual carriageway passes the effective start point of the day’s tour – the turn off for Apache Junction. Gradually, the road widens to more and more lanes until it becomes the eight lane freeway which links back on to the 101 Loop North to Scottsdale and the respite of the hotel pool. It’s at this point that you’ll notice the outside temperature reading in the car climbing again from the (relative) cool of the higher ground just left, although inevitably, as here, you’ll run out of memory card two degrees before the high is reached! For this Apache Trail adventure, we’d rented another damnable Ford Explorer to undertake the trip, and left it until the last weekend of the holiday so that we could benefit from a good rate with Hertz (this time booked through Hertz.com using the bmi Corporate Discount Plan number), picked up from the on-site desk at the hotel and to be dropped off back at Sky Harbor. The Ambassadors had confirmed that a 4pm checkout was available (perfect for the 7.25pm BA to Heathrow) and we spent the last hours at the hotel around the Canyon Suites pool in the company of precisely two other couples. Come departure time, we were literally deluged with offers of assistance, and the folio was ready for inspection at the front desk. For only the second time on the trip (the other being way back at the other Starwood property we used – the Four Points in Kamloops) the bill was cent-perfect, having had each fourth night comped, the internet charges zero-ed and all the other lines totalled correctly. Although the senior Ambassador was not on shift, I felt it appropriate to leave a gratuity for the whole team and gave this to one of the more junior Ambassadors in a sealed envelope with a note to pass on. Although it only amounted to a few dollars per person per day, I was delighted to receive an email of thanks from the senior guy within a few days of returning home. He and his team have since been of further assistance, I believe, to number of visiting friends and colleagues. At long last, tanned and relaxed after the hectic schedule of the first half of the trip, the door staff loaded up the Explorer for us and we headed back to the Rental Car Centre at Sky Harbor. There was a slight hitch enroute however, as the car had initially been provided with the tank 7/8 full. Unfortunately, the fuel gauge wouldn’t play ball during refilling, and I accidentally topped the tank. On arrival back at the car drop-off, I mentioned this to the guy zapping the cars in and he sent me off to the office. Without a murmur, the desk agent refunded $15, which was probably slightly more than the overfill was worth. Having become used to fairly rubbish Hertz service almost everywhere, this was a doubly pleasant surprise.